We all know how important water is. 70% of the Earth is covered by it. Our bodies are mostly water, too, and we can’t survive for more than a few days without it. But did you know that water is also used to make the clothes we wear, the cars we drive, and even the electricity that powers our homes? It takes significant amounts of water to produce many of the things we consume everyday. When combined with the effects of climate change, the world’s precious water resources are at serious risk. Experts warn that current trends could set us on a path toward a global water crisis with devastating consequences. It turns out that our energy choices in particular have big implications for water resources. We use water to produce energy in power plants, as well as to extract, process, and transport fossil fuels like coal and natural gas. In recent years, energy supply has accounted for nearly 15% of global water withdrawals annually, according to the International Energy Agency. Solar power, by comparison, is notably water-friendly for a variety of reasons, and can help to reduce water use across the board. Here are seven ways solar panels can help save water. Conventional electric power plants use vast amounts of water to cool themselves off. In 2010, U.S. power plants were responsible for 45 percent of total water withdrawals, 38 percent of total freshwater withdrawals, and 51 percent of fresh surface-water withdrawals for all uses, according to the US Geological Survey. Solar panels, on the other hand, generate power with no need for cooling and no need for water. A January 2015 report by the International Renewable Energy Agency (IRENA) reveals that producing a unit of electricity with solar panels uses as little as 1/200th of the water used by a typical power plant. In 2015, solar energy systems deployed by SolarCity collectively avoided more than 32 billion gallons of water use at America’s power plants. That’s enough to fill 49,000 Olympic-sized pools. In contrast, extracting and processing fossil fuels often requires vast amounts of water. When fossil fuel companies drill for natural gas and oil, they often inject high-pressure liquid into wells to “fracture” underground rocks so the fuel can be extracted. This high-pressure liquid consists mostly of water, which is why they call it “hydraulic fracturing,” or as it’s more commonly known, “fracking.” After fracking, even more water is needed for refining and transportation. A study from Duke University found that energy companies used nearly 250 billion gallons of water to extract shale gas and oil from fracking in the US between 2005 and 2014, which generated about 210 billion gallons of wastewater. Coal mining in the United States also uses a lot of water, around 80 million to 230 million gallons each day — the equivalent of 10 million to 20 million showers, says the Union for Concerned Scientists. Furthermore, the EPA estimates that strip mining of coal by mountaintop removal has buried almost 2,000 miles of Appalachian headwater streams. Like all industrial processes, making solar panels involves some water use. But smart methods in industrial manufacturing – such as efficiency and recycling – can minimize the water footprint and environmental impacts. For example, SolarCity expects its new solar panel manufacturing facility in western New York will recycle 70% of the water use once the facility is operational. Water recycling and efficiency also have helped Trina Solar, one of SolarCity’s panel suppliers, reduce water use more than 43% over a four-year period. A water conservation organization called the River Network provides a comparative analysis of the lifecycle water use of energy sources. According to the analysis, wind and solar panel technologies have by far the lowest water use. A major reason that solar panels (“photovoltaic solar” in the chart) use comparatively little water is that once they are manufactured and installed, they use absolutely no water to generate electricity during their operating lifetime (SolarCity’s panels last for more than 35 years). Using solar power can also reduce your water footprint on the roadways. Since solar power generation has a small lifecycle water footprint, driving an electric car powered by solar panels likewise has a minimal water impact, especially when compared with gasoline (an oil-based fuel that propels the vast majority of today’s vehicles). Just like coal and natural gas, oil takes a great deal of water to extract and process. Argonne National Laboratory estimates that it takes roughly 3-6 gallons of water to produce one gallon of gasoline. The U.S. consumes around 375 million gallons of gasoline per day, which translates into several hundred billion gallons of water consumption per year. Liquid biofuels, such as ethanol, can similarly involve enormous amounts of water in the growing and processing of energy crops. Argonne calculates that creating a single gallon of corn-based ethanol can require over two hundred gallons of water consumption. If you’re into saving water, it’s likely that a driving a solar-powered electric vehicle is a wise choice. 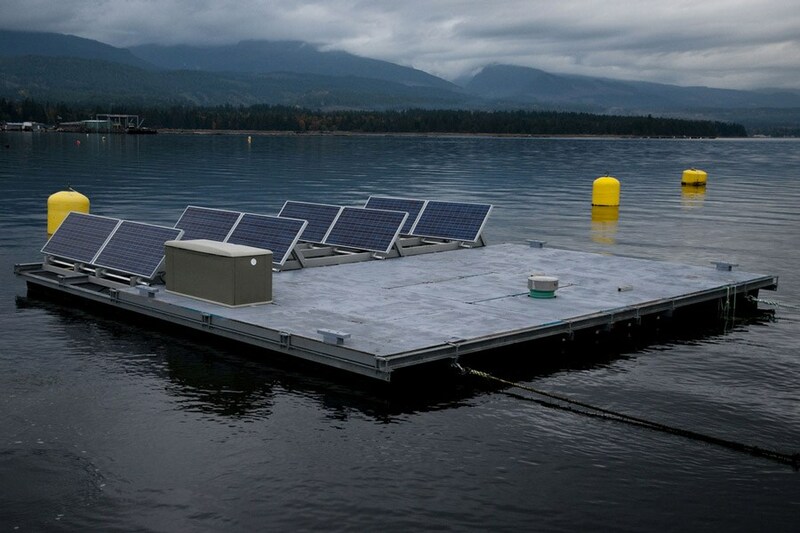 Floating solar farms, also cleverly called “floatovoltaics” are becoming a thing, from Napa to Japan. Partially covering reservoirs and large bodies of water with solar panels not only increases clean power, but also reduces evaporation. For example, when a vineyard in Napa installed floating panels on an irrigation reservoir, it not only powered the vineyard but also reduced evaporation by 70%. Left unchecked, evaporation can result in dramatic water losses from bodies of freshwater. For example, Lake Mead loses about 800,000 acre-feet of water each year to evaporation, according to the US Bureau of Reclamation. Water utilities that treat drinking water often spend a large part of their operating budget on energy. As part of SolarCity’s water district solar projects, we’ve installed numerous solar systems for water utilities to help them reduce energy costs, from Los Angeles to Connecticut. That can help save and improve water resources in a couple ways. First, solar-powered water facilities don’t need to use as much electricity from water-intensive power plants. Two water treatment plants in Sacramento, CA – among other facilities across the nation ‑ have partnered with SolarCity to power their operations with solar energy. Second, with less expensive energy bills, water utilities can spend the extra resources on things like better water efficiency and state-of-the-art water technology. That’s good news for all water consumers. We need to solve water problems quickly before they get to a crisis point. Well, it’s hard to find a water-saving solution that’s spreading faster than solar power. In fact, a solar panel system is installed in the U.S. every 2.5 minutes. This entry was posted in Solar Power and tagged Solar Energy.